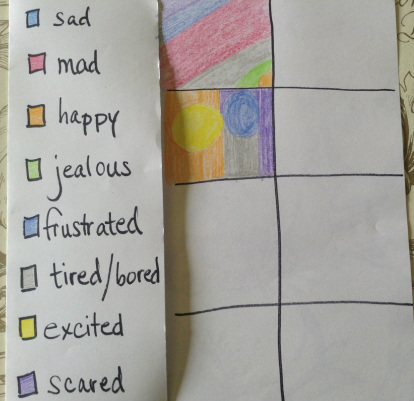 During my grad school internship, I was introduced to an art therapy technique that may be old hat, but was new to me: a feelings map. I now use it all the time with individual students! The first step is to fold the paper with a fourth folded into the middle to create a flap. On the flap, students are asked to write down a list of feelings, either a generic list or ones they have experienced that day (week, month, etc). This become the "key" to their map. It can be helpful to provide a list or poster of feelings words with pictures that is age appropriate for the artist (I like this emotions poster). Then the student chooses a color to correspond to each feeling listed. Next, the student takes some time to create a map of their feelings using the colors from their key. The student should be instructed to draw a small amount of color for a feeling they have not experienced much, and color a lot of the colors that they have felt more often. Stress that there is no "right way" to do this, they don't have to use all the colors, and that everyone's map will come out differently. The fewer directions given, and examples shown, the better! Allow the student to color in silence, unless s/he initiates conversation. After the student indicates that the map is done, invite him/ her to share the different parts of the map. Some students choose to name different parts, while others will tell a story. A few students may choose not to share at all. Allow the student to lead the direction of the conversation. I have found this activity to be incredibly therapeutic for the child. I discovered that creating one for myself helped me to better articulate how I feel, and knowing oneself is an essential skill for counselors! Give it a try... you may find it helpful, too. One variation for individuals you see more regularly, is to create a grid on the map portion. Students can create their map for the day, then return to do the same next session. I find that some students really enjoy this activity and request to do it even if I forget! Also, the area created under the flap can provide a space to write down notes about why students had a strong emotion (if they shared), or a space where they can draw about some of the big emotions they aren't ready to discuss yet. Some students found the space necessary for adding additional feelings to their key, which was great because they are adding to their emotional vocabulary and skills! These feelings journals were recently created. They can be a little more abstract but less demanding of students who may feel uncomfortable discussing their emotions like feelings map require. We used old counseling catalogues that are constantly finding their way to my school mailbox to create collages. I am also glad that we used heavy duty construction paper for the inside pages, as we have since done more collages. 2. Cut out pictures of animals that represent how the student feels at school, at home, and a couple other places s/he choses. Or have them choose an animal that represents a good friend, someone they have problems with at school, and self. The latter can provide some interesting insights and great discussions! 4. If you have counseling catalogs, the student can cut out the titles of counseling books that fit how they are feeling that day. Discussing during and after each collage can provide valuable processing for the student. Students love to take these journals home and show their family members, as well.